Recently I was part of an international jury at the 29th Aydın Doğan International Cartoon Competition in Turkey. Some of the jurors and competitors were from countries where citizens who criticize the government can find themselves in prison. In Turkey, there are more than 100 journalists and a number of mayors and activists jailed by the government on invented charges. In the U.S., our President has been labeled an extremist-Muslim-Communist-terrorist-Kenyan-alien plotting the destruction of our country. The punishment for the accusers is having Fox microphones and cameras thrust into their faces. We are protected from arbitrary arrest by our Bill of Rights, which, generally, our government has adhered to since the Constitution was adopted. 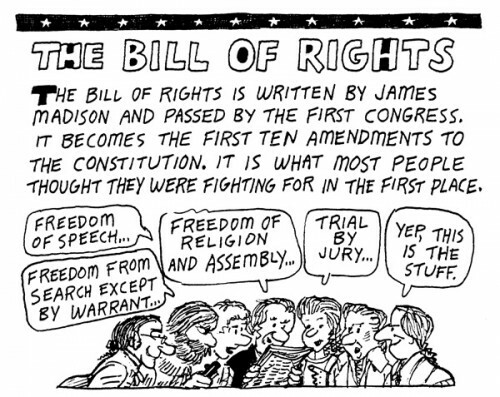 Many people today probably think the Bill of Rights is the Constitution, but it wasn’t even part of the original document. What Federalists like Washington, Hamilton, Adams, and Madison actually created with the Constitution was a strong central government that was good for business and muscular enough to protect those in power from the people. 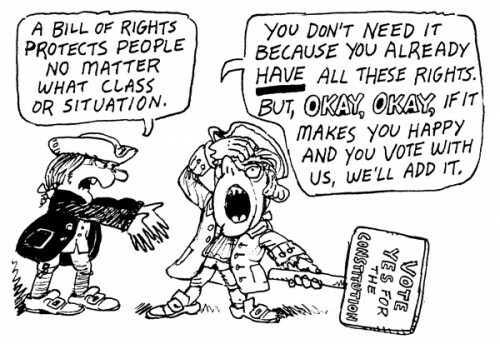 But when it came time to vote for or against the Constitution, many citizens refused to give up their demand for a Bill of Rights. I came across these fantastic cartoons as I was putting together some lessons for my students. I was hoping to use them in my class with your permission. 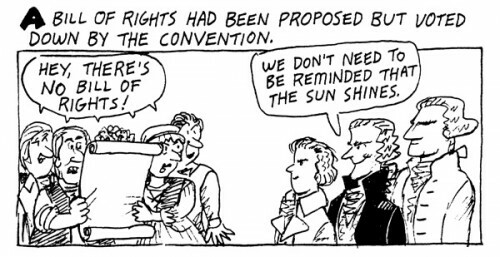 Such a great way to teach about the debate between the Federalists and Anti-Federalists, and expose my students to political cartoons as well. Please contact me at your earliest convenience. Thanks! Just found Mr. Mack’s website and where to buy his books! Next Next post: NBM in August: Liberatore is back!